The Dolce CampoReal Lisboa resort lies in the Torres Vedras district, around half an hour’s drive north from the capital, where residents have the use of a spa and two swimming pools, a couple of tennis courts, an equestrian centre and, of course, an 18-hole golf course. Laid out by Martin Ebert when he was still with Donald Steel’s design company, CampoReal (which translates as “Royal Meadow”) first opened for play in 2005. The course occupies a 135-acre property that’s characterised by rolling terrain and steep, forested valleys. A round starts and ends with a par five (holes 17 and 18 are back-to-back par fives) and water comes into play on the opening two holes and at the short par four 9th, where the tee shot is threatened by a pond. Elevation changes are a regular occurrence, requiring the odd blind shot to be played. 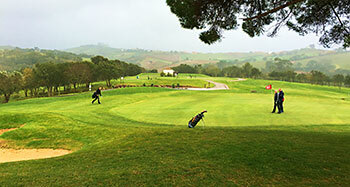 The club hosted the final two editions of the Ladies Portugal Open on the Ladies European Tour in 2010 and 2011. Karen Lunn of Australia won the penultimate event by a stroke then Ashley Simon from South Africa claimed the title the following year with an aggregate total of 200, sixteen under par.